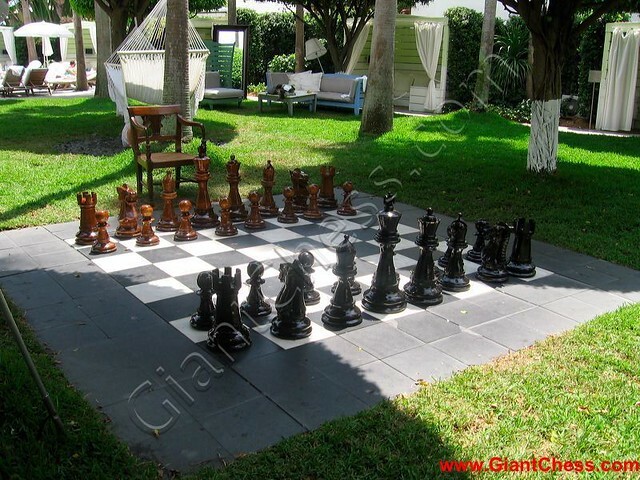 More people are like to play outdoor chess game using jumbo chess size. You can see in the picture above! It is a set of jumbo chess pieces completed with its suitable squares board for chess game. It is more fun and challenging to use it at outdoor area. Its jumbo size takes place rather wide and free. Don't worry about its durability, because the jumbo chess set has made from the strongest wood in the world called "Teak Wood". Teak wood itself is popular wood material for outdoor furniture and trusted by many people. The jumbo chess pieces also handmade product which has carved byb talented craftsman from java island, so that result unique and beautiful carving chess pieces.